1. Approach bidding methodically. 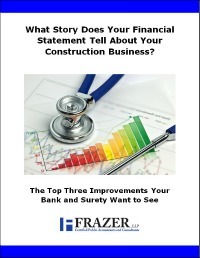 Many construction companies got in the habit of submitting multiple, aggressive bids during tougher economic times. Now that, generally, many building markets are on the upswing, it may be time to pump the brakes and refine your process for targeting jobs that could boost the bottom line. Another effective use of a CRM system is to track your bid-hit ratio and identify your most profitable projects. This way, rather than bidding in a scattershot manner, you can focus on the types of jobs best suited to your company’s strengths. Key data points include bid date, the award date and, if you’re a subcontractor, when a general contractor mobilizes its staff. Track this information over a long enough period and you should see average bid to mobilization times. The word “times” is plural because your averages will likely vary depending on project type (public or private), job size and the nature of your work. It’s helpful to follow several averages, distinguished by contract type, so that you can accurately compare similar circumstances with a prospective contract. As your backlog grows, estimate how long it will take you to deploy workers and assets to each prospective project. If mobilization times start heading toward untenable lengths, you’re likely heading toward backlog troubles. 3. Manage customers’ expectations. Let’s be clear: A sizable backlog is a nice problem to have. It likely means your reputation is strong and your services are in demand. And there may be times when you simply can’t afford to turn down profitable work. In these cases, managing your backlog becomes a customer relations issue. Make sure you’re not, inadvertently or otherwise, enabling unrealistic expectations of the timeliness of your work. Educate customers about the design phases of a project (which can buy you some time) and emphasize that job quality depends on a realistic timeline to completion. Above all, instruct everyone in your workforce to maintain the confidentiality of your backlog. Only trained sales staff and estimators should discuss scheduling with customers — and they should do so only with a clear, up-to-date perception of where your backlog stands. We welcome the opportunity to learn more about your business, take a proactive approach to cash-flow management, or other issues your construction company may face. Click the button below for a complimentary consultation.